Edwin Sahayan scored a double to give Northpole Labasa a 2-0 win over Tailevu/Naitasiri yesterday. A good crowd attended the opening round of the 2015 Vodafone Fijian FACT at Ratu Cakobau Park, Nausori. Tailevu/Naitasiri came out strong in the beginning putting pressure on Labasa with good attempts by Apisai Sesewa. Labasa found it difficult to put a goal past Josaia Ratu. Equal chances by both teams but none could capitalised on the opportunity leaving the scores 0-0 at half-time. Labasa came back dominating in the second-half creating more opportunities. Ken Doidoi had a chance to give Tailevu/Naitasiri a chance to lead from a free kick just outside the box but kicked it straight to Ratu. Labasa made some technical changes which made a difference to the side. In the 80th minute, Labasa’s Edwin Sahayan drew first blood. Three minutes later Sahayan scored another goal to seal Labasa’s victory from a header inside the box, 2-0. 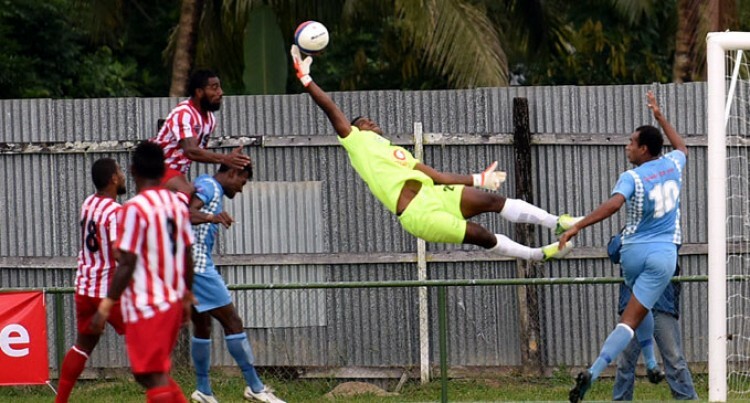 Tailevu/Naitasiri goalkeeper Josaia Ratu made good saves to prevent Labasa from scoring more goals. Labasa showed class on the field capitalising on Tailevu/Naitasir’s poor defending.